A few days ago, Samsung has announced the GamePad Smartphone, a controller optimized to take advantage of the gaming capabilities of smartphones. 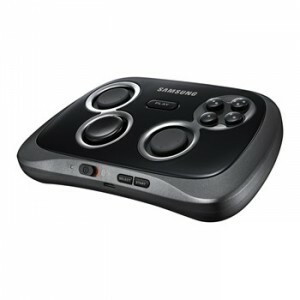 This GamePad uses Bluetooth 3.0 and fits with devices with sizes between 4 and 6.3 inches. However, you can also play at distance, so you can use it in larger devices such as tablets, TVs or monitors. The Smartphone GamePad is optimized for Galaxy series devices with Android 4.3, such as the Galaxy Note 3 Note II and S III. In these devices, the GamePad connects directly via NFC, and it also has an exclusive button: the “play”. This button is located at the center of the controller, allowing direct access to the Mobile Console app, an exclusive app that Samsung has developed specifically for the occasion. It is a kind of Game Center where you can find all the games compatible with the GamePad. 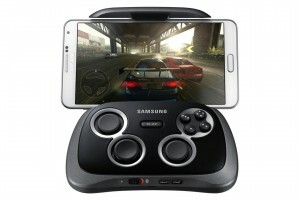 So far, Samsung has announced that the Smartphone GamePad will come with 35 dedicated games, and promises more for 2014. Currently, there are titles of all genres, such as racing games (EA’s Need for Speed ™ Most Wanted and Gameloft ‘s Asphalt8: Airborne) of FPS (Gameloft ‘s Modern Combat 4: Zero Hour), sports (SEGA ‘s Virtua Tennis ™ Challenge) and action (Ubisoft ‘s Prince of Persia: the Shadow and the Flame). The Smartphone Gamepad has all the controls you would expect from a controler. It consists of a directional 8-way pad, 2 analog sticks, 4 action buttons, 2 triggers, a ‘select’ button and a ‘start’. It’s compatible with Android 4.1 or higher, although it’s optimized for devices from the galaxy series with Android 4.3. It’s not known yet when it will be fully released or which will be its price, but the first market where it will go it’s the European.